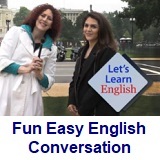 ﻿ Fun Easy English - new classroom free online classes english language lessons speaking listening writing reading january 19. 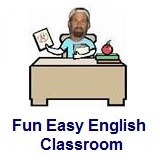 Today in the Fun Easy English classroom you are going to learn about American English slang. Knowing the slang used in American movies, television, and popular music is very cool. You will be able to understand native American English. Slang is the non-standard use of words in a language and sometimes the creation of new words or importation of words from another language. Slang terms are often particular to a certain subculture, such as skaters, or musicians. 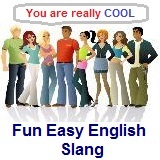 Slang is used extensively in American TV, movies, music, literature, and in conversations among native English speakers. I think that we should "hang" at the beach today. The meaning of this slang term is to "spend time." The word "hang" has a completely different meaning in standard English usage. hang - To fasten from above with no support from below. Studying slang is important in order to understand American TV, movies, music, literature, and conversations among native English speakers. International students who are studying English should not use slang too often in their daily conversations with native American English speakers. Slang is generally an unsophisticated form of expression and can sound very strange if overused and especially if used incorrectly. Conversation Lesson 19 - When Do I Start? In this lesson Anna has to walk to work because the Metro is closed. She calls to tell her boss she is late. Ms. Weaver wants her to come and talk about a new assignment. What will Anna do? Anna: Hi there! Summer in Washington, D.C. is hot and sunny. I always ride the Metro to work. Riding the Metro is cool and fast. But today it’s closed. So, I am walking to work. (On the phone) Ms. Weaver, I am late this morning. The Metro is closed. So, I am walking to work. Caty: That’s too bad. It’s really hot today. Caty: When you arrive, please come to my office. I have important news to tell you. Anna: Of course. Good-bye. My boss has news for me. The question is: Is it good news or bad news? Caty: Anna, I have good news and I have bad news. Which do you want to hear first? Anna: The good news. No … okay, the bad news. Caty: The bad news is you are not good at reading the news. Anna: Oh. I am very sorry to hear that. Caty: So, starting next month you will not read the news. Anna: Next month is July. You are firing me in July. Caty: No. I am not firing you in July … or in August or in September. That is the good news. Anna: Okay. You are not firing me. I am not reading the news. What will I be doing? Caty: Well, you are good at asking questions. You are good at talking to people. You are good at showing your feelings. And you are great at being silly. Anna: Thank you, Ms. Weaver. But what does all that mean? Caty: I have a new assignment for you! Your skills are perfect for a new show … a children’s show. Anna: A children’s show ... That is awesome! When do I start? Caty: You start next month. Start thinking of ideas for the show. Caty: Those are great ideas, Anna. Please go think of more … at your desk. Anna: Yes. What other things can I show them? Mt. Everest! Everyone has different skills. You have skills. I have skills. The important thing is to know what you are good at. Until next time! Learn to pronounce the new words for this lesson and the months of the year. Learn about using which for offering choices and every or next with time words. In this video, learn how English speakers say the second month of the year. What are your skills? Do you use them at work or at school? Tell us about a couple of skills you have. Write about it in the Facebook Comments section below. Then practice talking with a friend about what you do at different times of the year. Click lesson activity to get the printable PDF version. The page opens to a new window.